Well, we are approaching our last weekend of cricket before the Christmas break!! This Friday will see our Junior Christmas Party!! It is always a great night for all – especially with the visit from Santa – timed beautifully to suit our younger and older children. The weather on Friday will be PERFECT (about time I hear)!!! – Anyone would think it is Christmas!! · If you have not yet RSVP’d, please let me know. On saying that, please come along even if you have not (It just helps with catering)!! Thanks to everyone who has already offered to assist in so many ways!!! After a really successful BBQ run by the seniors on Sunday (Profit of $1,800), the Juniors have an opportunity on Saturday 13 January at Vermont South. I attach the current roster. If you can please spare two hours, please let me know. This is a great way for the club to raise funds – from those outside the club!!! I will have raffle books available on Friday night. Again, if you think u can buy a ticket for $5, or alternatively take a book to work to sell, please let me know!! This is another great way to make some money – so we can reinvest back into the club!!! All tickets sold at $5, come straight back to the club!! Memberships to the Melbourne Stars (C’mon) and Melbourne Renegades (Boo), should be arriving very soon – and definitely before Christmas for all junior players (excluding Milo). If you have not received them by late next week, please let me know!! Team Photos for all age groups (outside of Milo) are now going to be held on the late afternoon of Sunday 4 February. Exact details and times will be advised in the new year. Please save the date. 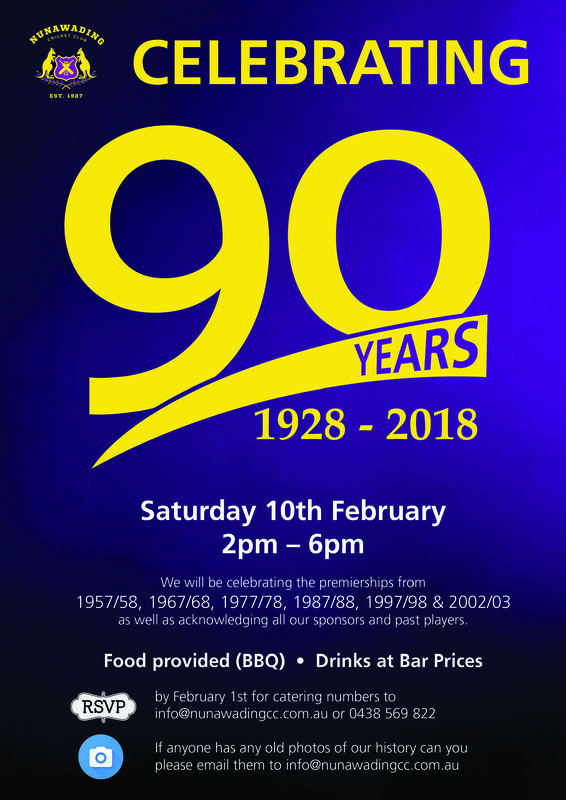 On Saturday 10th of February, we will be celebrating our 90 year anniversary. This will be a great afternoon, so please keep it in your calendars. More information attached.